This list presents the best luxury destinations in South Africa, as rated by our well-travelled critics. Whether you’re looking for traditional affluence, a star-studded urban getaway, bushveld decadence, or historic charm, you’ll find it in at least one of South Africa’s most luxurious destinations. 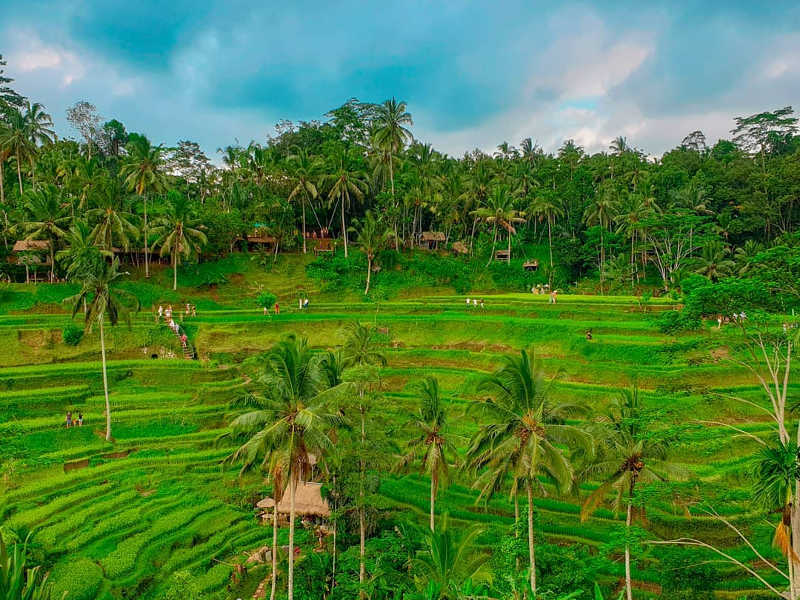 While South Africa is loaded with historic sights, cultural diversity, natural attractions and almost limitless activities; these aspects are hard-won against the destinations on this list which will encourage travellers in search of lavishness to linger a little longer in the lap of luxury. Cape Town – the Mother City, is one place on everyone’s “to go” list. 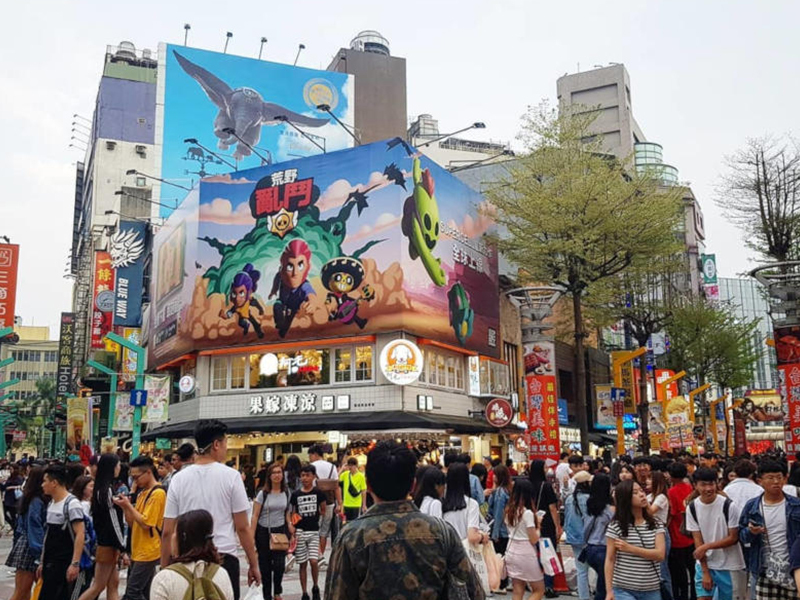 Host to numerous top entertainers, South African personalities, Silicon Valley type entrepreneurs and throngs of expats that came and stayed, it is the place to see and be seen. 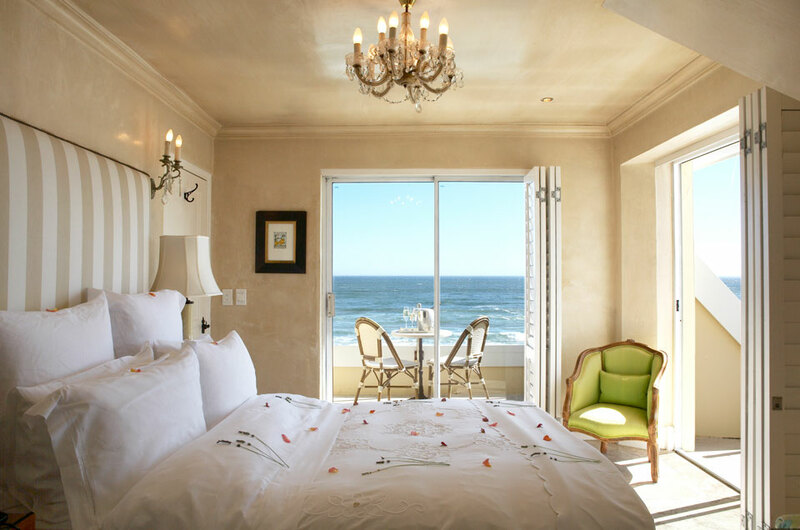 As the namesake of the mountain range that forms its inspirational backdrop, The 12 Apostles Hotel overlooks the Atlantic from its enviable oceanfront position on the scenic Victoria Road stretch between Camps Bay and Llandudno. The hotel itself is far enough away from Cape Town’s buzzing streets that you’re able to mollify in secluded exquisiteness, but close enough that you’ll never feel left out of the glittering options Africa’s ‘Riviera city’ is home to. With an award-winning spa, a well-equipped fitness centre and two swimming pools that seem to blend into the sea just beyond, The Twelve Apostles doesn’t disappoint in the luxury stakes and has been rewarded accordingly judging by its trophy cabinet bursting with accolades from the likes of TripAdvisor, Condé Nast and more. High tea, a dedicated whisky and wine bar, and knowledgeable and enthusiastic staff are just some of the luxurious offerings that make the Cape Grace in Cape Town’s world-class Waterfront precinct so illustrious. The hotel, comprising over 120 rooms with mountain or harbour views, has held pride of place on a private quay in the V&A Waterfront for the past 16 years. And with the world class Victoria & Alfred Waterfront shopping and entertainment complex on your doorstep, you won’t be wondering what to do after exhausting the high teas and whisky bar. Editor’s Note: The Cape Grace is near Market on the Wharf at the V&A shopping centre – don’t miss out on experiencing one of the Mother City’s newest and brightest creative foodie delights. Situated in Constantia – the Cape’s oldest wine valley – The Last Word enjoys a location that’s in close proximity to 8 of South Africa’s top wine estates, as well as several globally recognised restaurants. 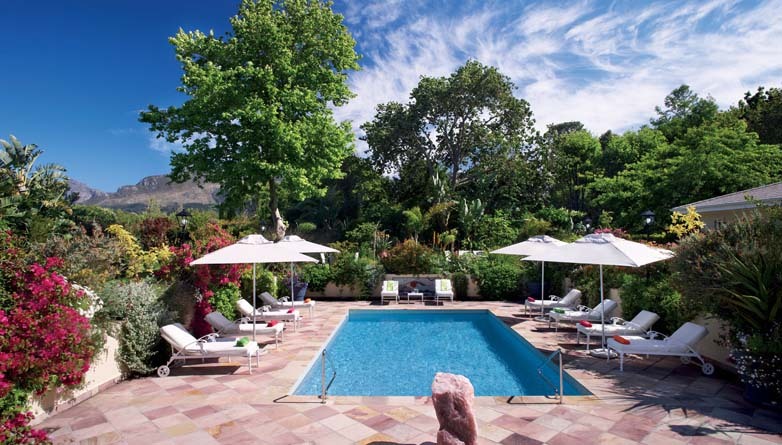 Offering guests intimate 5-Star lodging in one of Cape Town’s most upmarket southern suburbs, The Last Word Constantia features 9 luxurious and unconventionally spacious suites which open onto private patios leading to the garden and pool. 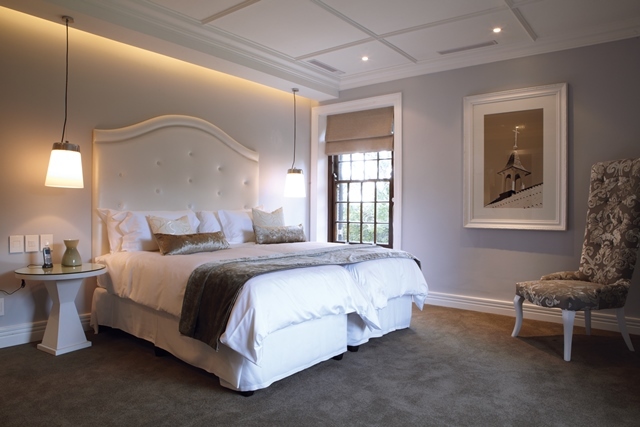 Located on a wine estate with a 300 year old heritage, the Owners Cottage at Grand Provence in Franschhoek comprises 4 expansive rooms and a deluxe suite – each with their own walk-in closets carefully designed to merge together industrial stainless steels, wire mesh and 400-thread count percale white linen. Fresh white roses and a large entertainment area next to the pool, complete with a private chef, is what you can come to expect, as well as complimentary tastings of some of their award winning wines. Be adventurous and go with the chef’s recommendation. Editor’s Note: Grand Provence is situated on the Franschhoek Wine Tram route – a fun way to explore the Winelands. Opened in 2003, the multi-award winning Birkenhead House was an immediate success and its desirable cliff-top location has everything to do with it. Looking directly on to the marine life of the Southern Indian Ocean, Birkenhead in Hermanus enjoys unsurpassed views of picturesque Walker Bay and the graceful Southern Right Whales which traverse its waters. A mere 90 minute drive from Cape Town, this hotel boasts a contemporary ambience where dinners are leisurely, staffs are friendly and knowledgeable, and the pace is laidback. Sometimes the only way to truly unwind is to completely change your routine – and a well-deserved escape to the spectacular Cederberg wilderness is sure to do the trick. 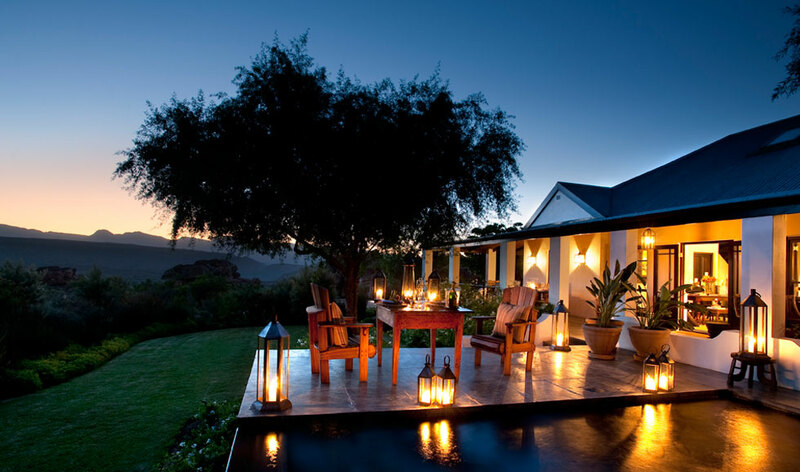 A blissful and life-changing luxury resort in the Cederberg, Bushmans Kloof is 3 hours from Cape Town and encompasses a wilderness reserve and wellness retreat. It was listed as one of the world’s best hotels (by Travel and Leisure in 2009) scoring 98.67 out of 100, as well as an award for ‘Best Service’ from Condé Nast. Editor’s Note: Read Bridget’s review of Bushmans Kloof. Bounded to the north by Botswana, on the south by the Free State and the Northern Cape, and on the northeast and east by the Limpopo Province and Gauteng, the North West Province is South Africa’s ‘Heritage Destination’ and home of game viewing and gambling. 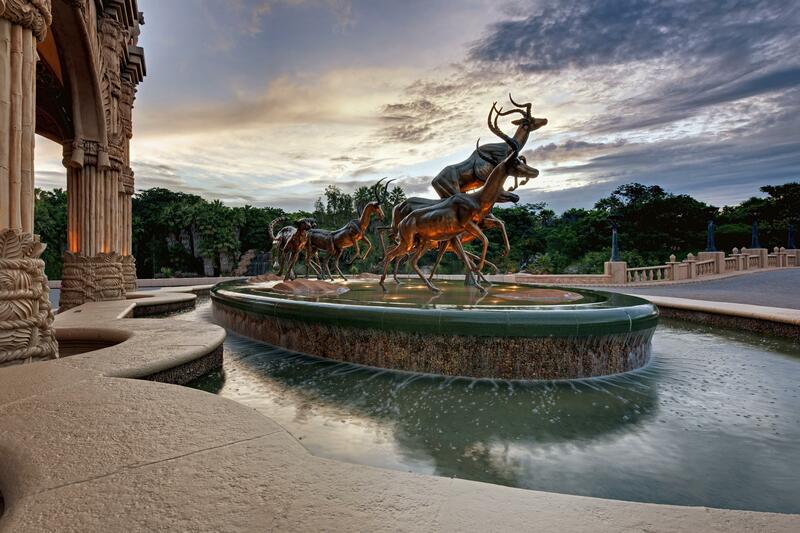 A landmark on the landscape of most adored luxury destinations in South Africa, The Palace of the Lost City has long been a sought-after getaway and is Sun City’s 5-Star flagship hotel. The Palace at Sun City is widely regarded as one of South Africa’s most-vaunted destinations for its imaginative architecture housing more than 300 spacious rooms, gracious hospitality and location nestled within the rugged beauty of SA’s North West Province. Highlights include the wildlife rich Pilanesberg National Park & Game Reserve, 2 magnificent golf courses, and the ‘Valley of the Waves’ – a purpose-built beach complete with mechanically-generated waves 700km from the coast. Morukuru Family in Madikwe Game Reserve offers a malaria-free bushveld experience. Comprising River House, Farm House and Owners House, the surrounding veld is known for its packs of Wild Dog. The Morukuru game lodge is the recipient of a 2011 World Luxury Hotel award; not surprising when you consider the Villas operate on an exclusive use basis, meaning you have the entire property to yourself, with personal staff to attend to your every whim. Even more wonderful are the utterly private safaris – your personal guide teams with a gifted Shangaan tracker to bring you the very best game viewing experience – including sightings of the Big 5. 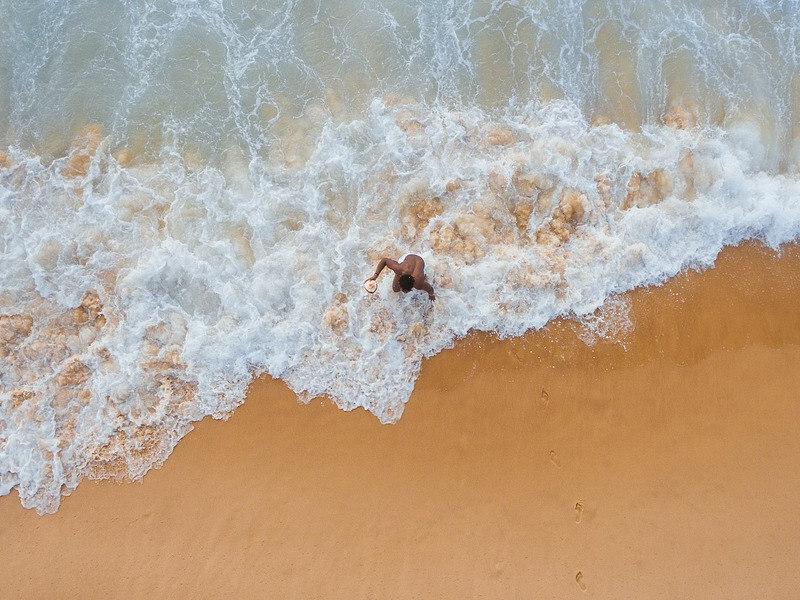 Hot, sultry and offering arguably the best curries in South Africa, Natal is a melting pot of cultures, activities and landscapes. In all directions, visitors can experience the diversity that makes the province of KwaZulu-Natal a firm favourite with South African holidaymakers. Wildlife and safaris up north on the Elephant Coast, Golfers paradise down the South Coast, the majestic beauty and outdoor splendor of the Drakensburg, the fascinating history of the Battlefields where Boer, British and Zulu encounters shaped South African history, all wrapped up in good weather all year round. Situated in an award-winning game reserve in the northeastern reaches of Natal, &Beyond Phinda Forest Lodge offers environmentally conscious safarigoers unmatched luxury in the bush with a strong focus on conservation and community involvement. Phinda Private Game Reserve has built a reputation as one of the best game viewing destinations in South Africa and the Phinda Forest Lodge is arguably the star of its 6 primary accommodation options. &-Beyond Phinda Forest Lodge features 16 “Zulu Zen” stilted suites, each with its own personal bar and private plunge pool. 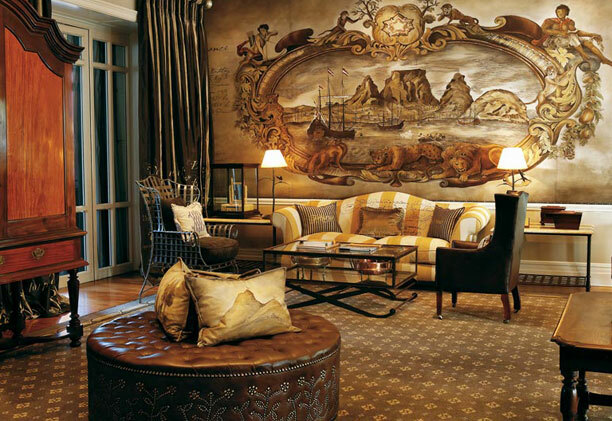 Having hosted royalty, it’s safe to say Durban’s 5-Star Oyster Box Hotel is no stranger to providing the kind of luxury guests of such high pedigree demand. 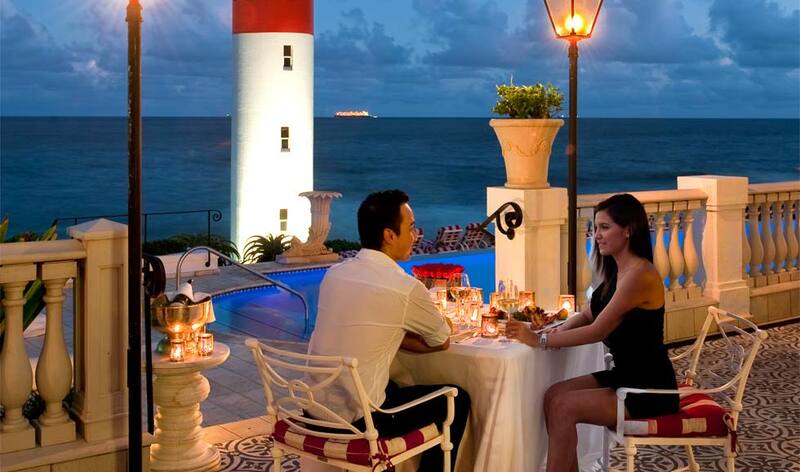 The Oyster Box has occupied prime position on Umhlanga’s beachfront since 1869 (it was converted into a hotel in the 1930s), and the warm Indian Ocean and iconic lighthouse provide the perfect nautical backdrop to this distinguished sea facing establishment. Fordoun Hotel & Spa occupies the green pastures of a working farm, which has a history dating back to the 1800s. In its enviable location near Nottingham Road in the heart of the picturesque KwaZulu-Natal Midlands, Fordoun’s original buildings and farmyard have been artistically and beautifully renovated into hotel rooms, walkways, gardens and restaurant, while the spa is unique in that it is built within what was once a large dairy and cattle feeding barn complex. Since opening in 2005 not a year has gone by without one of Fordoun’s celebrated features (the hotel, spa or restaurant) winning an international or local award for excellence. 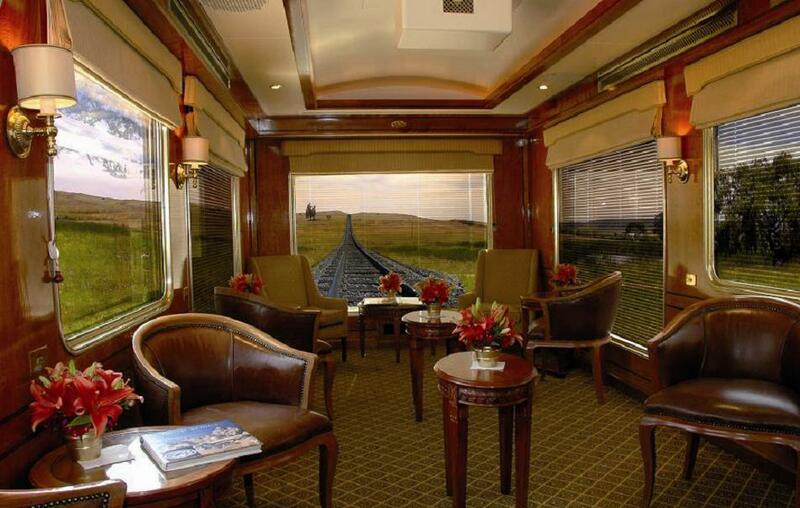 Experience the extravagant opulence of rail travel through Africa on Rovos Rail, one of the most luxurious trains in the world. Rovos Rail combines the nostalgia and lavishness of pre-war travel with subtle modern innovations. Guests can relax in the privacy and comfort of spacious carriages, each with a perfect blend of period ambience and modern features. The second locomotive luxury destination to appear on this list, the iconic Blue Train offers passengers the chance to explore some of South Africa’s most exotic landscapes, the Blue Train is an all-inclusive railway voyage which has been synonymous with luxury hospitality, tourism and adventure since 1946. 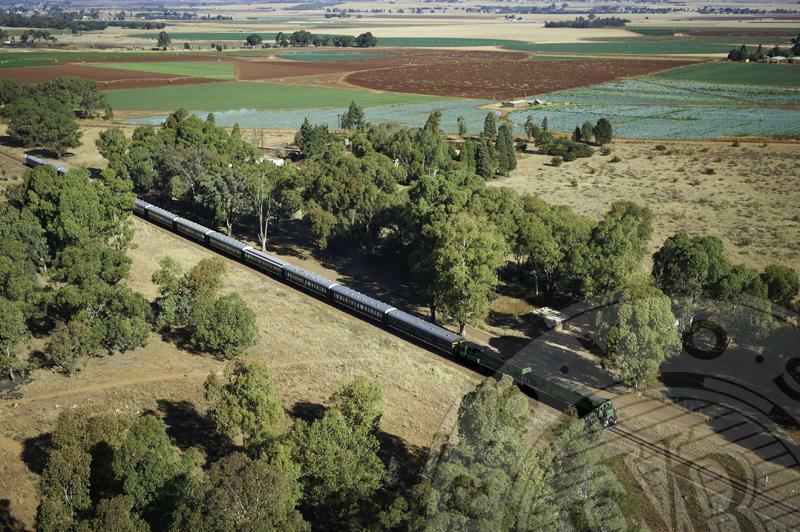 On board the train guests enjoy supreme luxury, five-star accommodation, indulgence in fine cuisine accompanied by some of the best wines South Africa has to offer, a dedicated butler per coach at your beck and call and stunning views of the countryside. Train trips between Cape Town and Pretoria are run regularly; but the train can also be chartered for any other route in South Africa. The adventure-rich Garden Route is world-renowned for its excellent selection of outdoor activities, from dolphin and whale sightings to bungee jumping, treetop canopy tours and other exhilarating pursuits. It’s heaven for golfers and offers one of South Africa’s most illustrious self-drive holiday options thanks to the quality stretch of road between Port Elizabeth and Cape Town. Each of the Views’ 18 suites seems to invite the nearby sea right into their lavish interiors. 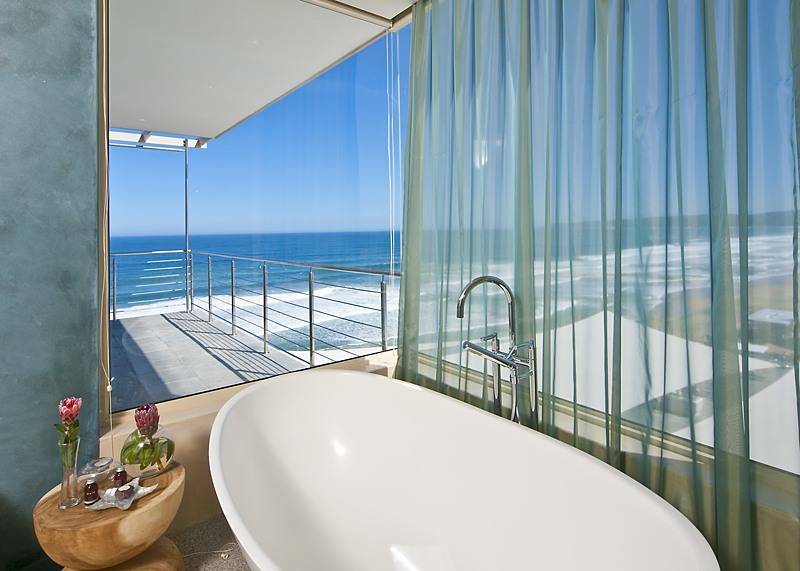 Add the spa & gym, private pool deck, Seaview Lounge, library lounge and a cocktail deck overlooking the beach, and you have a meticulously composed hotel in the heart of the Garden Route. Nothing has been left to chance, and every need is catered for, all accompanied by impeccable service. Despite its remote Garden Route location, the Views Boutique Hotel is easily accessible via George Airport (25 minutes’ drive) with direct flights from/to Cape Town, Johannesburg and Durban. 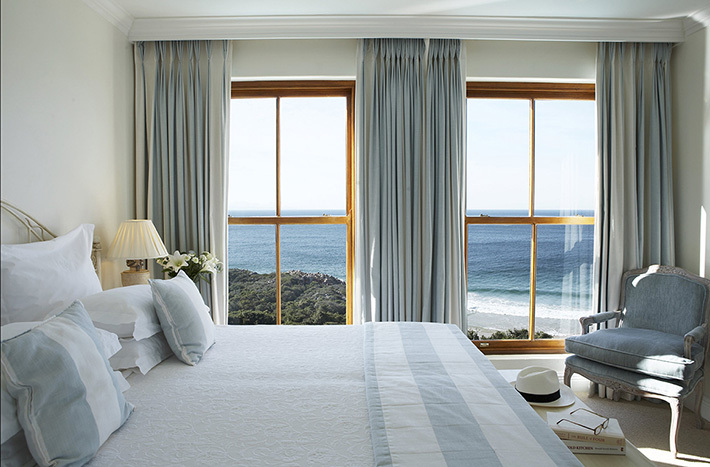 Situated on a rocky point in one of Southern Africa’s most impressive resort towns, The Plettenberg offers guests 37 individually decorated rooms and suites, each with their own spectacular views of sea, mountains and sand. A seaside property unlike any other, guests can only expect the best in service, cuisine and location when they check into The Plettenberg. Beneath the grandiose Outeniqua Mountains, Fancourt’s original homestead (1859) has been reimagined to form the Manor House – a stately National monument that offers guests the modern comforts of a 21st century hotel and the grace of old world charm. 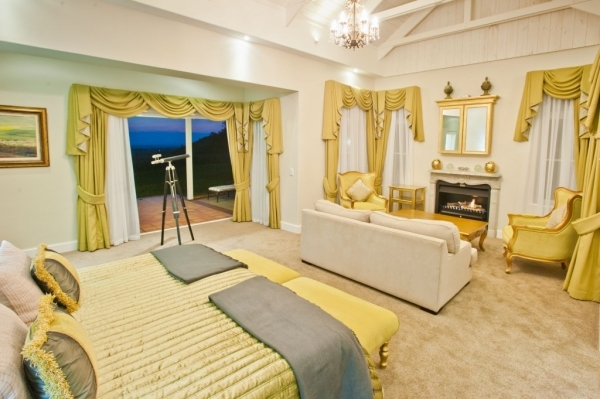 The Manor House at Fancourt features 18 suites including the Master Bedroom; all offer a personalised butler service. An array of daytime indulgences is on your doorstep including 3 Gary Player signature golf courses, a spa, indoor and outdoor pools and a variety of restaurants. You could be forgiven for thinking Pezula Private Castle is 007’s hideout. From its Cliffside location overlooking secluded Noetzie Beach in Knysna, Pezula Castle is surrounded by an endless expanse of deep blue sea, indigenous forests, and a shimmering lagoon framed against a backdrop of majestic mountains. Wide-ranging leisure activities include archery, tennis, an animal farm, horse riding, driving range, hiking and canoeing. Each room at Pezula Private Castle has its own fireplace and the personal service includes an executive butler and private chef. Don’t depart before experiencing a treatment in the serene spa. 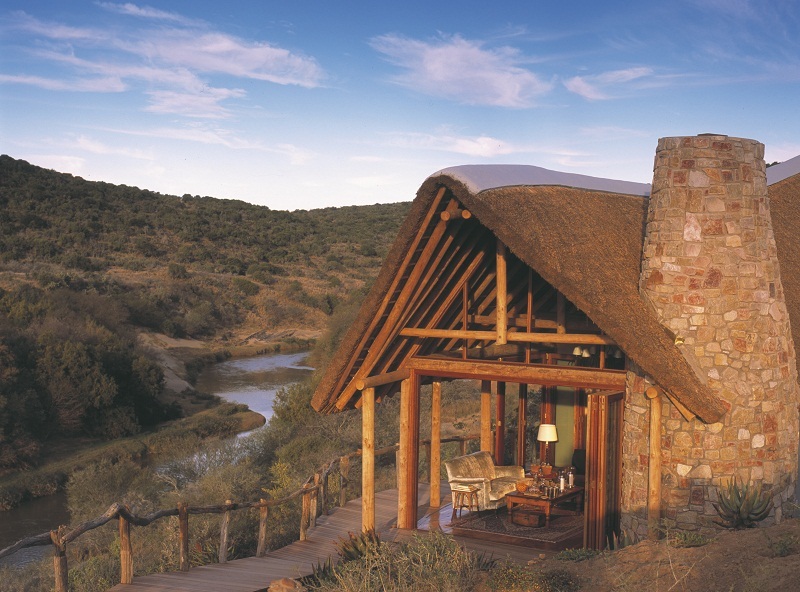 Known for Cheetah sightings, Great Fish River lodge forms one of 4 lodges at Kwandwe Reserve and is the only one with a view of the river. It is perhaps the most tranquil and is ideally suited to honeymooners and guests with a penchant for privacy. Each of the 9 suites has floor to ceiling glass doors and shutters, allowing for fantastic views of the reserve (even from your bath and bed!). Each room also has a private plunge pool, while the interiors are a stylish combination of traditional farm house and African chic. Situated in a private concession bordering the greater Kruger Park, Sabi Sands is known for its leopard sightings. Singita is a name synonymous with the best in bush luxury and their fully-inclusive lodges do not disappoint. At Ebony, an onsite sommelier takes care of your food and wine pairings fresh from the cellar which houses over 2000 specially selected SA wines; while bush dining options are also made available to contented guests. Each of the 12 rooms has its own plunge pool; and inside the colonial interiors lend themselves to an atmosphere of pith helmet wearing adventure from days gone by. 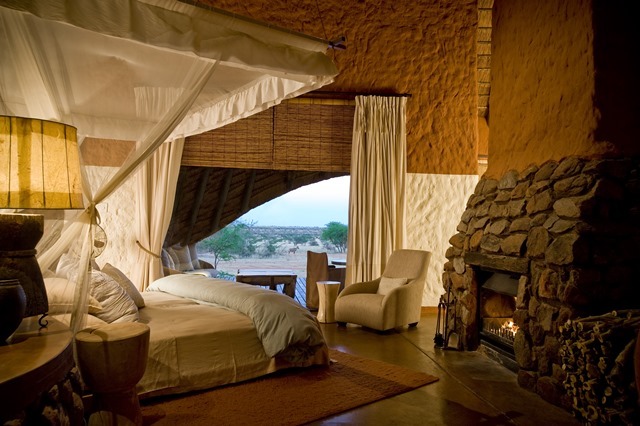 Owned by the Oppenheimer family, Tswalu Kalahari Reserve is South Africa’s largest private game reserve (twice the size of Pilanesberg National Park and bigger than the entire Madikwe Reserve). Tswalu is Malaria free and has outstanding game offering sightings of some of South Africa’s rarest and most extraordinary wildlife. No more than 30 guests at a time can discover the beauty of this landscape, its diverse wildlife, and the serenity of what may well be South Africa’s last great wilderness. When it comes to luxury travel in South Africa the possibilities are endless, and a list of 20 is probably just the tip of the iceberg. Remember to Tweet your luxury destination suggestions @Travelstart or leave a comment in the box below. 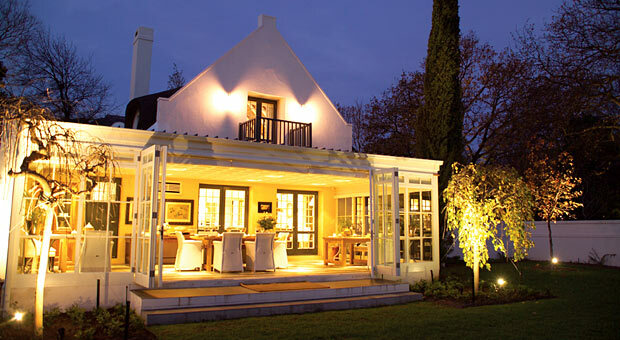 You might also be interested in South Africa’s Best Boutique Hotels. A dream trip for me to one day ride the Rovos rail and take the hike up the Drakensberg mountains in South Africa….some day!! My fiancee and I are picking a place to spend our honeymoon. Is it too expensive to go on a rail travel (Rovos Rail)? The other option we’re considering is Hotel de Sal Luna Salada, it’s only 119 Euros per night (here, if you’re interested http://www.hotelyouwant.com/spa-hotels/). Which variant is better and more affordable?
? I have only been on their website but I’m not sure if you could give us advice on that or maybe suggest other Lodges that offer hunting opportunities nearby that would be lovely….that you so much for sharing these beautiful place we shall plan to visit these places on our next vacation. That’s amazing and truly luxury collection of travel destinations in south Africa. Everyone must visit to South Africa for a once in a life time experience..
South Africa is very diverse and has so much to offer for all kinds of tourists. It should be on everyone’s bucket list of places to visits. South Africa is a truly magnificent place to visit, rich with culture its true what they say it’s a melting pot you will find a bit of everything here and it’s all unique. Thanks Russell for shearing this great post about 20 Incredible Luxury Destinations In South Africa. we stayed two days at Kwandwe in February this year and can only agree with the Great Fish River Lodge must be included in your luxury list. Thanks again, keep posting like this. Africa is one of the leading destination for tourism because of natural beauty and biodiversity of wildlife . The above list of luxury location for south Africa tour is perfect . Wow, I would happily stay at all of them! The service you receive at hotels like this really make it worth it, and the settings of them are wonderful. we stayed four days at Kwandwe in september this year and can only agree with the Great Fish River Lodge being included in your luxury list. it was simply phantastic. everything was top notch from game sightings and accomodation to food and service. we have definite plans to go back! One can only but dream…………………..
Could not agree more with the list of places you have chosen, especially the Garden Route with Knysna and Plett, and as well as the Blue Train and its scenic route. I can only dream. I have never seen so many beautiful places in such a small space on one website. 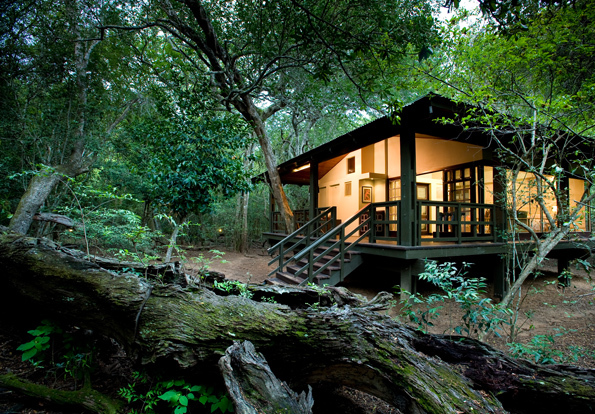 Wow, truly dreams can come true in & Beyond Phinda Forest Lodge!!!! 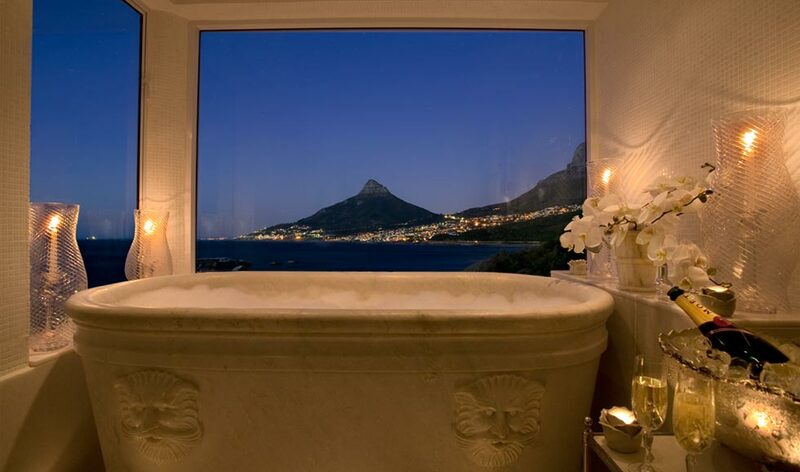 The Twelve Apostles Hotel and Spa, Camps Bay looks like an absolutely amazing place to be relax and be spoilt at!.